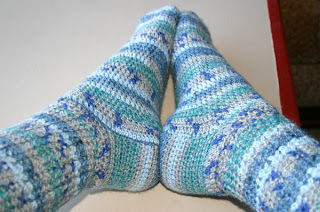 I finished a pair of crocheted socks for Rachel - sure hope she likes them. (Details are here.) This is the first pair I've ever made for someone besides myself. 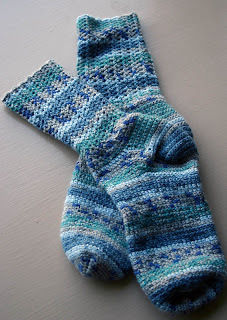 It's not that I'm selfish (ok, maybe it is - I really enjoy wearing handmade socks) but they're a lot of work to do for someone you don't love a lot. 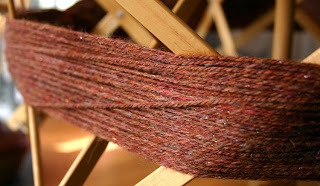 I also Navajo-plied the first bobbin of 'Red Sky At Night' from roving I bought several years ago at Spinderellas. A photo that better captures the glitz and sparkle is here. My yarn counter doesn't work for crap, but I think this is about 225 yards of DK-ish yarn. I have another big bobbin ready to ply, plus another 3-4 ounces to spin. I'm hoping to get enough yarn out of this to make a shawl. I **love** the color and the sparkle.